From Mary Wade: I first started attending worship services at the Reconciler on a regular basis in 2007. I, like so many others, left a more conventional church, in this case a large and wealthy Episcopal church in downtown Birmingham. To be true to what I knew as God’s call to me, I decided that I had no choice but to join the Church of the Reconciler because of the impact that this congregation had on my life and my calling to serve others as was being done there. Crucial to this decision were the sermons, discussions and actions of both Lawton and Kevin Higgs. A sad commentary is that the Reconciler is such a rarity in American Christianity as it worked to expand our understanding of the Gospel. Shortly after the death of my 100-year-old Mother in 2009, I announced to Kevin one Sunday that we needed a medical clinic, and so space was made for such a purpose. Assisted by other nurses, and as a nurse practitioner myself, we have gotten to know our neediest ones in a more intimate way as they share their medical, spiritual and emotional needs. I truly meet Jesus as we hold hands, check blood pressures, pass out band aids and cold medicine, as well as when we exchange the Passing of the Peace and share Communion during the worship service. When I first learned that the Higgs would be on “an extended vacation” I was speechless. But due to a vow of silence that was imposed on those that knew only an inkling of what was occurring, I, along with the rest of the congregation and community, was unaware of the unjustified complaints and accusations made against these two saintly men. Lawton, who had the vision eighteen years ago to establish a racially and culturally inclusive church succeeded against all predictions by his colleagues. And Kevin’s grasp on the radical call of Jesus to inclusiveness (radical hospitality) was liberating as my understanding increased regarding the true meaning of the life, words and actions of Jesus. The actions of the DS, under the direction of the Bishop of the conference, are beyond belief in their total disregard for the integrity of those that developed such a diverse and inclusive community. The way in which these two fine men (the Higgs) have been treated should be seen as an undermining of their life work and ministry, in spite of what is said in public about the shining example the Church of the Reconciler has meant to this Methodist conference and the other conferences. The way in which the leadership of the church has been disregarded and stripped of positions on the Board and other leadership positions is unjustifiable. The very ones that participated in a developing a thriving and growing congregation that is much more than a ministry to the homeless are now disenfranchised from leadership positions or being members of the Board because of signing a letter of complaint, as is allowed according the Discipline. 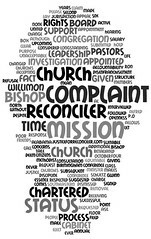 The actions of both the Bishop and the DS are egregious and their treatment of committed Christians in this congregation calls for accountability! The reason for the website “Justice for Reconciler” is in the hopes that concerned Christians and members of the community can ask questions and learn the truth. Since our voices have been kept quiet, we have had no choice but to bring this story into the light. I trust that you will ponder and pray about our cry for truth that can only then bring healing. We ask for support as we seek truth, justice and reconciliation. From Rev. William Ray Wade: As a retired Baptist minister, I was pleased to discover a congregation that was ministering to homeless and indigent people in Birmingham, as well as including them in the congregational life of the church. Rev. Lawton Higgs and Rev. Kevin Higgs obviously made a big mistake by taking seriously the teachings of Jesus on inclusiveness and confronting empire. 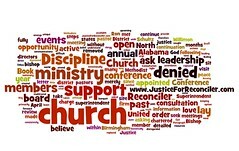 In my opinion what has been done to the ministry at the Reconciler and to the careers of Lawton and Kevin by the institutional Church, especially the North Alabama Conference of the United Methodist Church, is disgraceful. The actions taken against them are a disgrace to New Testament integrity. To explore the reasons for my thoughts, I highly recommend a reading of Robin Meyers two books: Saving Jesus from the Church: Stop Worshiping Christ and Start Following Jesus, and The Underground Church: the Subversive Message of Jesus of Nazareth.